The warm weather is finally here again and I see a gluten free picnic (or two) in your future! That means dusting off the grill, eating outdoors, attending pool parties, and all that the glorious summer fun that gets turned into great memories. Rather than leave you scrambling for some wonderful recipes to bring with you to these types of affairs, we decided to compile our 30 top gluten free recipes for a summer picnic! Part of the reason behind why we put this together was rather selfish. You want to enjoy a summer picnic just as much as anyone else. But there’s a real void in wonderful summery meals that were safe for you to eat that also felt familiar to those who do eat gluten. These gluten free picnic recipes please everyone and allow you to feel included in the festivities (and even have people in attendance rave about your meal!). And if you’re thinking about hosting a summer picnic or party, but are unsure of how to keep yourself (or someone else) safe from gluten and other food allergens, CLICK HERE for our guide on how to host a gluten free picnic or party. A good grilled main course is probably one of the first things that comes to mind when you think “summer”. It is for us anyway! Here’s a mix of dishes (some are even paleo or vegan-friendly) that will kick your gluten free picnic dish up a notch or two. If you’re nervous to grill at someone else’s home due to food getting contaminated with gluten (and yes, it does happen), check out our Gluten-Free Grilling Guide to ensure your food stays safe! PS. If you’re thinking about cooking any of these dishes at someone else’s home, keep in mind that gluten hides in many microscopic spots that may make your food risky to eat. You may want to cook in your own home and then bring the final product to the other person’s party. CLICK HERE to discover the 10 most surprising spots where gluten hides in a kitchen. You simply can’t have a party without pairing your main course(s) with many wonderful plant-based dishes. Loaded with flavor and gorgeous color, guests will love the flavors. Everyone loves great sauces to dress their main course and even some sides too! These classic recipes have a slight twist in order to turn the volume up on flavor. Each of these recipes is highly versatile and can be used for both meat and vegetable-based dishes. There’s no need to avoid dessert any longer at a picnic (if you’re bringing one of these!). These desserts are light, cool, and refreshing which is definitely appreciated on a hot summer day. Again, each of these options just happens to be gluten-free so your gluten-eating guests will be none the wiser and asking you to share the recipe. If you’re looking to cool down and chill out this summer without alcohol, you’ll be more than satisfied with the unique, enticing flavors in these non-alcoholic summer drinks. Try whipping these up at your next summer shindig! And if you do drink alcohol, but are worried what you can safely drink that won’t get you glutened, CLICK HERE to check out our guide to Gluten-Free Alcohol! Leave a comment below sharing YOUR favorite summer GF recipe! 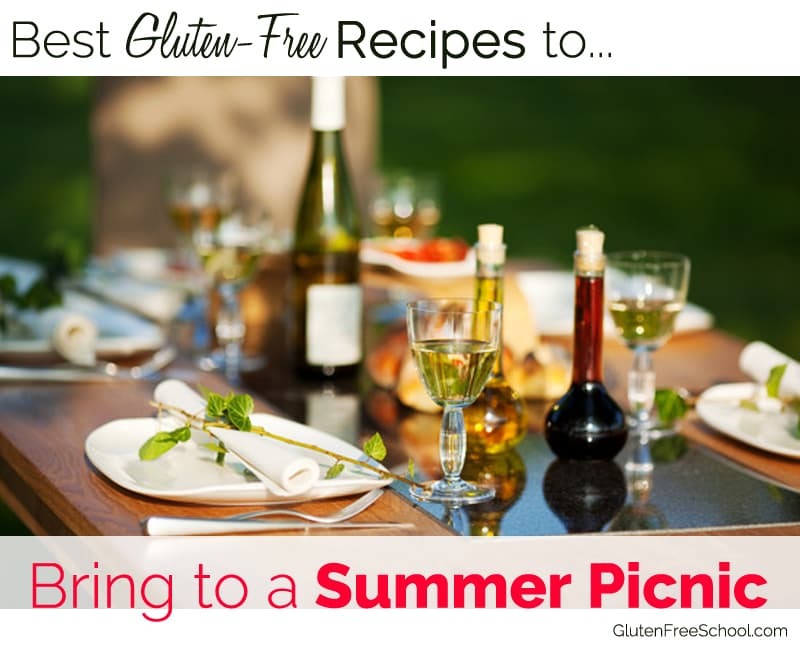 These gluten free recipes will make your summer picnic the best! Make sure that you do these recipes so you will have a safer eating time with your loved ones.